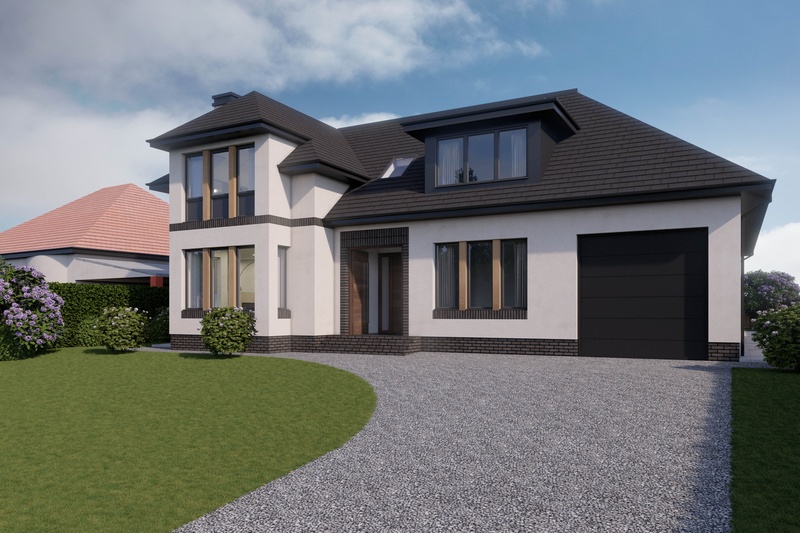 An impressive new build detached villa finished to a high standard and specification overlooking Rouken Glen Park. Completion - Anticipated late Spring/Summer 2019. A contemporary detached villa principally built of white rendered brick walls under a pitched tiled roof, carefully and thoughtfully planned internally with generous living spaces, enhancing the feeling of space and natural light, set within generous garden grounds. 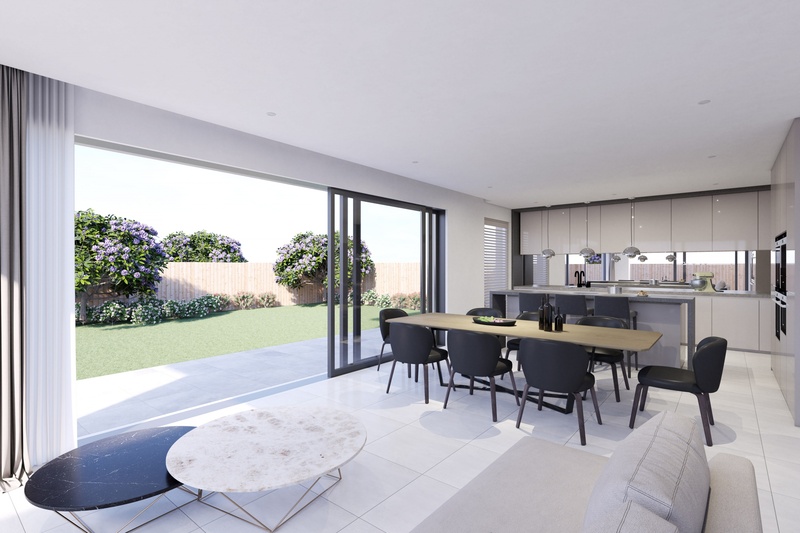 The property will extend to approximately 3541Sqft or 329 Sqm (including garage) and offers a scale and proportion of accommodation over two levels that is seldom found today. Ground Floor: Entrance vestibule. Large welcoming reception hall. Walk in cloakroom. Formal sitting lounge with bay window. Living room enjoying access to terrace. Family room/guest bedroom. 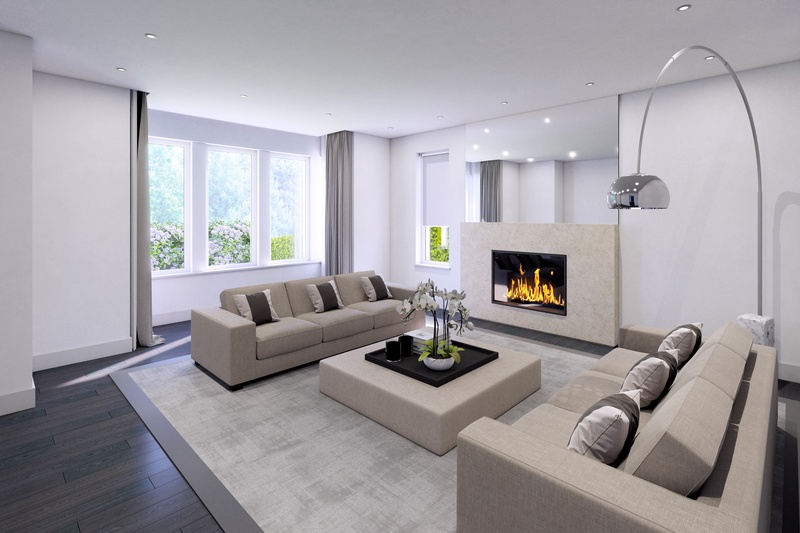 Spacious and bright combined family room, kitchen and dining room with bi-fold doors open to enclosed rear gardens. Well appointed kitchen with central island unit. Guest WC/shower room. A separate utility room with internal courtesy door to the garage completes the ground floor accommodation. 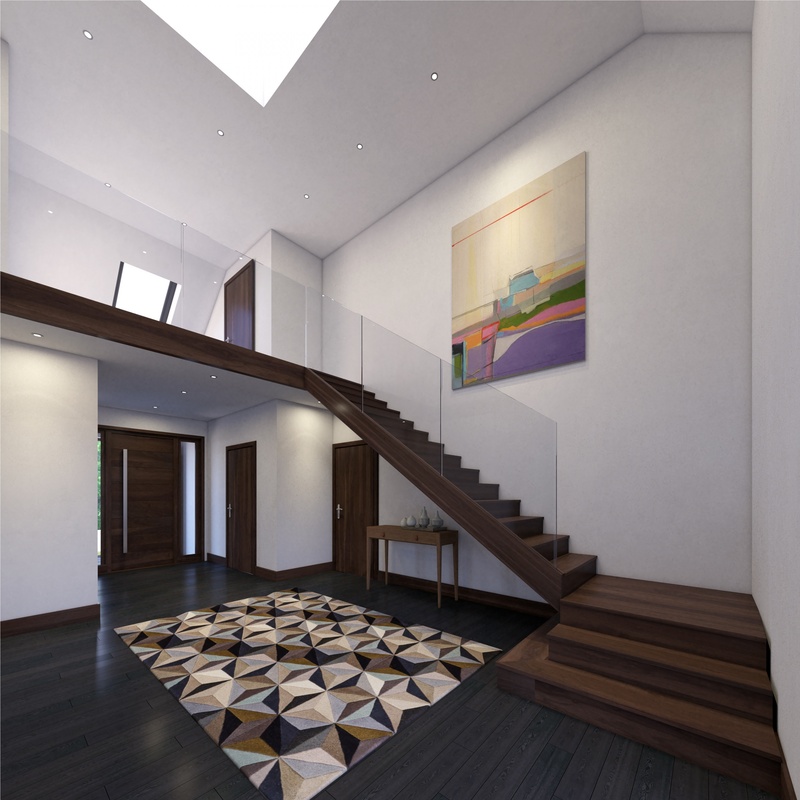 First Floor: Galleried upper landing gives access to four double bedrooms. 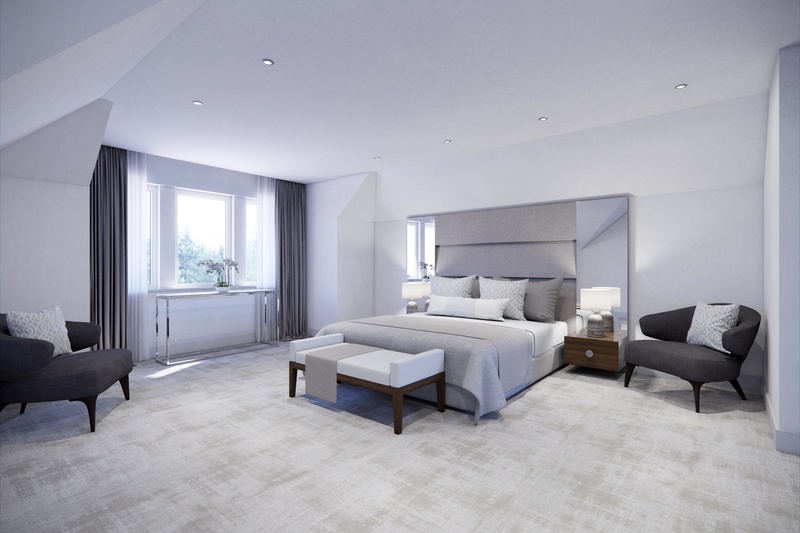 Generous and spacious master suite with walk in dressing room and ensuite bathroom with separate walk in shower enclosure. Bedroom two with ensuite shower room. Bedroom three and bedroom four, both double size bedrooms are serviced by the house bathroom. Completion - Anticipated late Spring/Summer 2019. External: The property will be finished in an attractive white render with decorative brick course under a pitched clay tiled roof. High performance double glazed windows finished in grey. External aluminium doors with painted grey finish. Deep flow og gutters. UPVC soffit and facia boards. Monobloc driveway and turning area with ample space for a number of cars leading to a single garage with internal courtesy door. Internal: Internal walls will be finished in emulsion paint and ceilings finished in white. Painted skirting boards and door facings with a feature staircase. Oak veneer internal pass doors with contemporary chrome lever style handles. Coving to all principal apartments. Kitchen: Bespoke designed kitchen, centre island and integrated appliances. Separate utility room. Sanitary Ware: Luxurious bathroom, shower rooms and co-ordinated tiling from Porcelanosa. Chrome down lights. Heating: Gas central heating with thermostatically controlled radiators and Worchester high efficiency boiler. Under floor heating in master bathroom. Flooring: Harwood flooring finished in oak to main public rooms, tiled floors within kitchen, utility room, bathroom and shower rooms. Self-coloured quality carpeting in bedrooms. Gardens: Landscaped garden grounds. Extensive lawns with terrace to rear, enclosed with timber fencing. General: External lighting with soffit down lights. 5 amp lighting circuits. Mains smoke detectors throughout. Brushed chrome switches. Architects Certificate: The property will be covered by a 10 year guarantee from the Federation of Master Builders. Giffnock and the neighbouring suburbs of Newton Mearns and Clarkston are acknowledged for its standard of local amenities and provide a selection of local shops, supermarkets, restaurants, regular bus and rail services to Glasgow City Centre, banks, library and health care facilities. This popular and leafy suburb is located approximately 8 miles to the South of Glasgow’s City Centre and is conveniently situated for commuter access to nearby M77/M8 & Glasgow Southern Orbital. 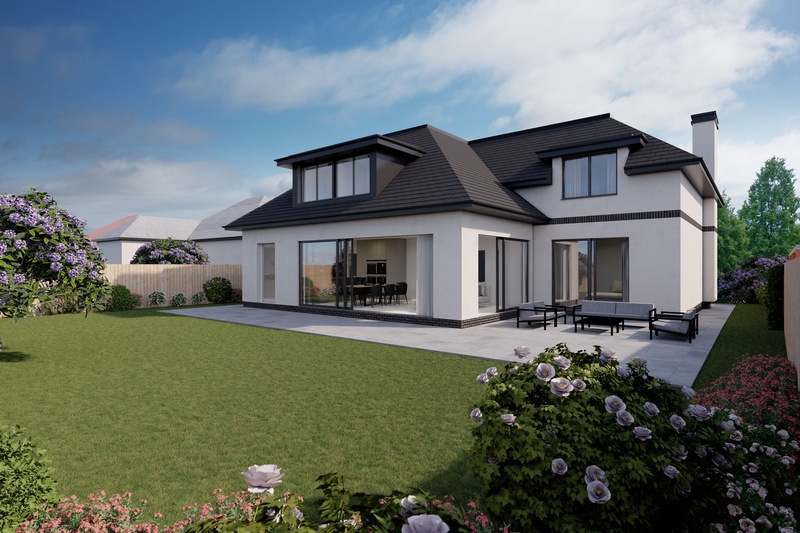 Rouken Glen Road is conveniently located for access to The Avenue shopping centre and Waitrose at Greenlaw Village Retail Park and is with walking distance to Whitecraigs Train Station. If you are an outdoors lover, Rouken Glen Park, voted Best Park in the UK 2016, is nearby with walking trails through the woods, a great adventure play area, a skate park, five a side football pitches and a boating pond. A wide range of sports and recreational facilities can be found locally to include David Lloyd Rouken Glen, Parklands Country Club, Nuffield Giffnock health clubs, as well as Cathcart, Williamwood and Whitecraigs golf clubs, Whitecraigs tennis Club and East Renfrewshire Council’s own excellent sports and leisure facilities at Eastwood Toll. In addition, this property sits within the catchment area for the highly reputable Primary and Secondary schools including St Ninians High School. The property is located approximately 1 mile from the private Belmont House School and within easy reach of various pick up points for Glasgow’s other private schools. Changes to current specification may be requested and subject to time of construction and installation. Changes may incur additional costs and costs can be obtained, if required. Agents Note: Please note that items specified in the literature may depict appliances, fittings and decorative finishes that do not form part of the standard specification. Measurements provided have not been surveyed on site. The measurements have been taken from plans, and as such may be subject to variation during the course of construction. Please contact Nicol Estate Agents for further information .